This article began with the simple question: why the search query “camera lenses” leads to tripods in the Electronics SAP Hybris demo storefront rather than the camera lenses products when we have a category named “camera lenses” and a product having “Lens” in its name. Try yourself! In addition to that, this product has “Lens” in the title that should make it even higher in the search results since we state that the search supports different word forms. In this article, I will explain why this is happening. Hybris uses Solr for a product search. For every user search request and some navigation requests, hybris calls the search engine. Hybris fetches data from the database, converts them into SolrJ documents, and sends to Solr Server in batches (100 documents each). There are overridable listeners executed before and after batches. There are also listeners before and after the whole indexing process. Full indexing recreates the index. For the update mode, only new and changed products are processed. 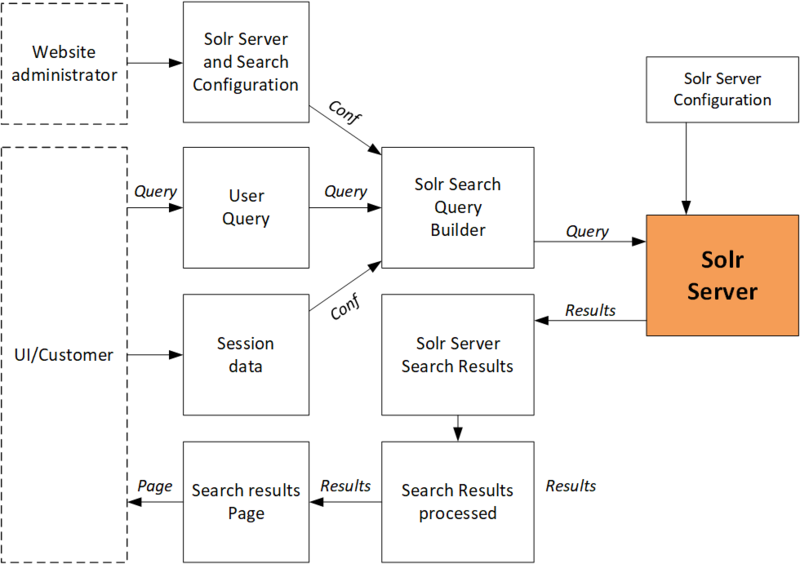 For the search, the system converts the customer search query into a Solr Search Query. Autosuggestion / autocomplete is built on the spellcheck functionality. Solr has Suggester component specially designed for this purpose, but for some reason Hybris decides to go with the old reliable spellcheck component. How does hybris find words for “CA…”? there is a Solr multivalued field called “autosuggest” (and its language versions autosuggest_) of the “text_spell” type. This type is defined as Solr standard TextField type. 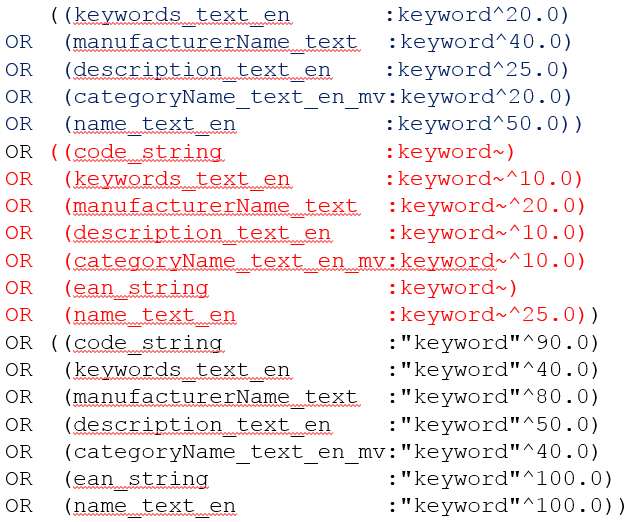 It contains lowercased tokens (words) from the product attributes configured as “autosuggest” indexed properties. Spellchecking uses the similar Solr interface. For spellcheck fields hybris uses a different set of product attributes. However, there are grey areas which are not documented well. For example, for a single-word request, Hybris generates a comprehensive multi-line query containing various filters and conditions. Understanding of this mechanism is crucial for troubleshooting, solutioning and customization. [!!!!] The explained below is relevant for (default) Lucene query parser, default hybris configuration, and version 6.4 of hybris Commerce. LuceneQParser is used only with OOTB Multi field Free Text Query Parser. See this article for explanations of the differences. The changes in the configuration may lead to different queries and ranking. Each line represents a condition. The number at the end is a boost factor used in the relevancy calculation. Boost factor is used to increase or decrease the importance in the filter in the query. Below I will show how this value is used in the relevancy calculation for search result ranking. OR (name_text_en:"kw1 kw2 kw3 kw4"^100.0))"
You may expect that for the request “compact Sony cameras“, the subphrases “compact Sony” and “Sony cameras” will be taken into account by the search engine and affect the relevancy. This is not so: only the whole phrase “company Sony cameras” is considered as a phrase having specific boost factors. Fine, now we are at the best part. Why lenses are at the 10th position? is involved in the phrase search, but it is not involved in a single keyword search. It means that if your query has nothing but the code, the boost factor 90 will be applied to your request, that is #2 after the exact name and exact EAN. So there are two intertwined phases, or processes, in the search engine: fetching relevant results and sorting them. Look at the conditions again: all of them are joined by ORs. Once any condition is true, and the product will be included in the search results, but, possibly, far from the beginning. In reply to my query, “camera lenses”, I got a number of product in unexpected order. According to the hybris search engine ( with the default configuration – not the best one), “Monopod 100” has overtaken “Schneider-Kreuznach Xenar 0.7X Wide Angle Lens, 55mm” which seems much more relevant. Put this wide-angle lens in your camera bag and soon you’ll be putting spectacular photos on your wall. Our SCHNEIDER-KREUZNACH XENAR 0.7X Wide-Angle Lens increases your angle of view a full 30 percent. -0.7X magnification (equivalent to 26.6 mm). -4-element, all-glass SCHNEIDER-KREUZNACH XENAR Lens. Capture breathtaking outdoor vistas like expansive ocean cliffs, a city skyline, or the crowd cheering their favorite team at the stadium. Or use it indoors to capture entire rooms—from piano recitals to the amazing exhibits at the Louvre. This all-glass, 4-element lens is developed in conjunction with SCHNEIDER-KREUZNACH so you know your pictures will be extremely sharp. Our camera lenses work together to deliver the high-quality pictures you expect. Both products have both keywords in two fields, categoryName and description. All other fields either not mentioned in the request or not contain any of the keywords. At this point, it should be clear how the search engine solves the first task, understanding what products have to be included into the response. Next phase is ranking these products and displaying them ordered by relevancy. Actually, all three Score formulas are the same. 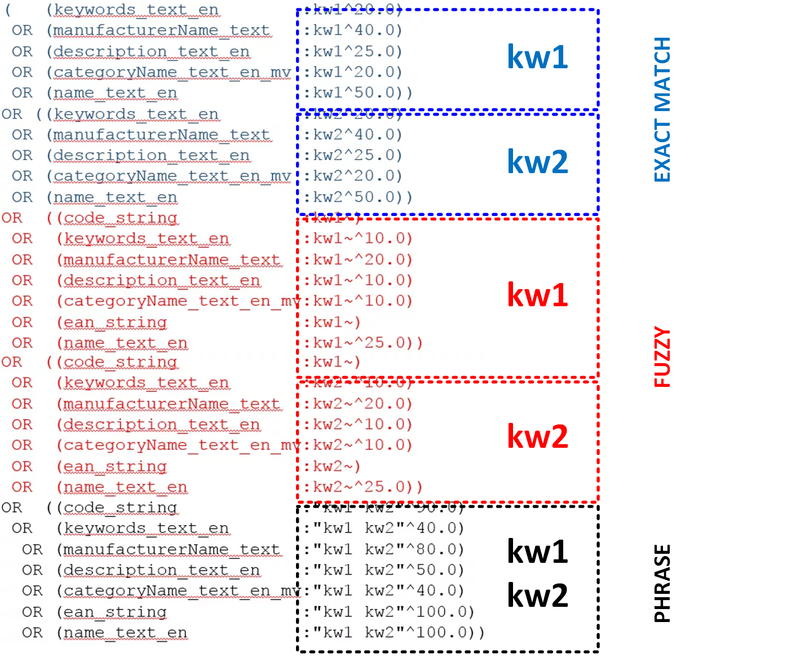 The only difference is a score factor, that can be different for Phrases, Fuzzy and Exact match (per field). Total score of Monopod is higher, and this is why its position is higher in the search results. But how these scores are calculated? What gives the win to the Monopod? There are different ways of how to calculate scores. Hybris uses Solr 6 which is based on last Lucene, which uses the ranking algorithm BM25 by default. So below I will explain the details of this algorithm. Where TF is Normalized Term Frequency. How often the term occur in the document. Where IDF is Inversed Document Frequency. How special term, how rare it is. How many documents a term appears in. “Inversed” means the following: very frequent terms have smaller values of IDF. We see that Phrase score brings the most significant contribution into the total score. Let’s take this score as an example to deep dive into details of the calculation. The phrase boosting factor (“Boost) is (see the table above) 50 for the description field. This value is the same for both products, because it doesn’t depend on the product. It depends only on the field (in both cases it is ‘description’). => Boost = 50 for both products. This value is editable via Backoffice for the fields. Hybris AdaptiveSearch can personalize boosts for whole categories and products. Hero products are products with very high boost factor. where n(qi) is a number of documents containing a word qi. and N is a total number of documents (in our example N = 340). For “camera”: qi = 108 documents. IDF(“camera”) will be 1.15. For “lenses” qi = 52 documents. IDF (“lenses”) will be 1.87. IDF = IDF (“camera) + IDF (“lenses”) = 1.15 + 1.87 = 3.02. => IDF = 3.02 for both terms. For the phrase “camera lenses” IDF is calculated as a sum of IDF(“camera”) and IDF(“lenses”), and not depend on the number of documents containing a whole phrase. averageLen is an average length of this field in all records. Length to average length ratio is important. Some topic occurring twice in your website pages says almost nothing about how much this website is about the topic. The same occurring twice in a short tweet, however, means that tweet is very much about it. The average length in our example is 115.01. For Monopod 100, the length of the description is 42 characters (“Canon Monopod 100 for SLR Cameras & Lenses”) . Actually, fieldLength is not simply a number of characters the field contains. It is calculated via complicated mathematical normalization (encoding/decoding) equation (basically compressing 32 bit integers to 8 bits to save disk space while storing the data). It turned out that the short description for Monopod 100 makes the Term Frequency higher, and eventually, makes the higher position for the product. This explains higher Monopod’s exact match, fuzzy match and phrase match scores. Just because this field is shorter, and the ratio len/averagelen is large, but once it is in the determinant, TFNorm is larger, and, consequently, the whole score is larger. Certainly, other scores also worked, but their contribution into the final score is smaller. You may ask, what about “Lens” in the name? Why it doesn’t take it into account? We see that “Lenses” is a plural form of “lens”, and the search has a stemming filter which is able to process word forms. Indeed, yes and no. There is a filter called SnowballPorterFilterFactory. This class dynamically loads Porter Stemmer algorithm that is generated from a set of rules. These rules are very simple, and a list of exceptions is limited. So, for the word “Lens” the stemmer creates a singular form, Len, that is not correct. A noun that ends with ” s” doesn’t necessarily mean it’s a plural. Porter knows about “news”, but doesn’t know “lens”. Solr tries to find “lens” (as singular from lenses) in “name_string_en”, but finds only “len” that is the different word. This is why Lens in the product name doesn’t work. Synonyms would help there a lot. This article is focused on Hybris 6.4 with Solr 6.1 support. Solr 6.1 is built on top of Lucene 6. Since Solr 6, Lucene uses BM25 as a default similarity method. I explained this algorithm above. In the previous versions of Lucene, Solr and old versions of SAP hybris, the default similarity class is based on simplified algorithm (see DefaultSimilarity, http://www.lucenetutorial.com/advanced-topics/scoring.html). That is why you need to test the search thoroughly after any change in the boost factors and tune the boosts…. but testing of the search is a topic for a separate article. Stay tuned! 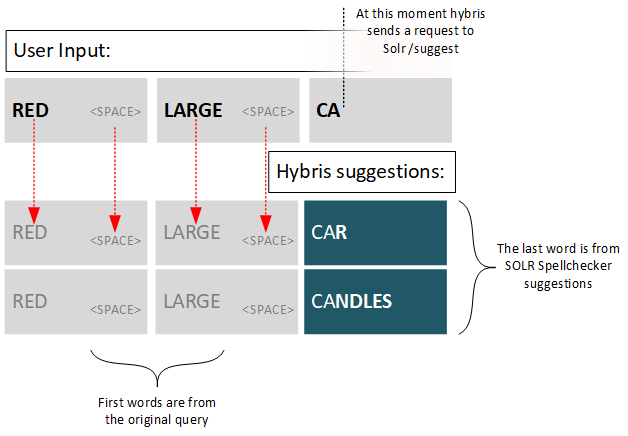 Hi, this is very informative article, with very good explanation for how the Solr and Hybris interact, specially the part about the algorithms. Just have one recommendation, you can use solrQueryDebuggingListener for debugging the Solr query from Hybris instead of extracting the query and pasting it in Solr admin. Nice article. I have a question about how will I achieve relevance search on multi-value fields? Because I have custom multi-value field in solr hybris configuration. I have question regarding solr query parameter, can i give dynamic value in solr query using custom request handler in hybris? Actually, I want to tell solr to document only those cart which are ideal and not converted into the order from more than one day. I don’t want to indexed whole cart data just like product data. Time duration will be configurable in solr search query which i think can be done using custom request handler. Is there a way to ensure that results match all terms across any of the fields? Alternatively, could you return results which reach a minimum relevancy score threshold? If you need to have the documents with all terms from the query, you need to use AND-search rather than OR-search explained in the article. Score threshold is a bad idea. The score formula may produce very different scores, and absolute value means nothing. Hi Rauf, my search has a few indexed fields with different boosts. A client asked why products with summary containing specific keyword are not showing up. Summary has a boost value 1. Model number has boost 10. 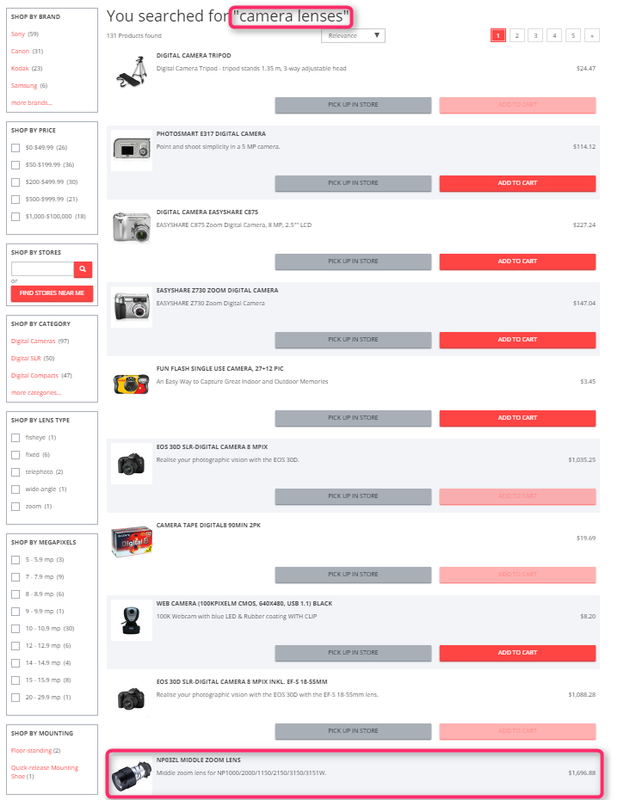 If I increase the boost of summary to 5, the number of products returned from the search increases and the ones that have the keyword in summary BUT no model number show up. With boost 1, they don’t. I can’t figure out why because I can see the summary in the solr query. Is there some relevancy threshold limit that ignores results? Thanks!